Microsoft's lack of Xbox success in Japan is notorious. Microsoft only sells between two and three thousand Xbox 360s a week in Japan. The system doesn't exactly scream retail hit in Japan. That hasn't stopped one shop in Japan's Yamaguchi Prefecture from creating a store with one thing in mind: the Xbox 360. Japanese blogger Mirian, who runs Xbox 360-centric blog Hakomaru Purasu+ (はこまるぷらす＋), opened an Xbox 360-centric retail shop called Game Shop Clarith. "Playing online was so much fun and it was easy to connect with friends," Mirian said about his zeal for Xbox. "You've got all the tools to enjoy yourself." The shop does feature Nintendo and PlayStation games (this is Japan), but the ratio is totally different from your typical Japanese game shop. Instead of being dominated by homegrown hardware and games, the majority of titles offered are for the Xbox 360. In the new games section, the Xbox 360 games take the top shelves, while the Vita games occupy the bottom shelves. Opening this month, Game Shop Clarith also offer retro games that should appeal to Xbox owns, notably Sega titles. 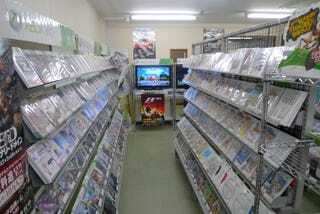 Sure, in Tokyo's Akihabara, there are specialty stores with many Xbox 360 games. What makes this shop so unusual is that it's rural location doesn't exactly open itself up to millions of pedestrians streaming by. No wonder IT Media titled its article "Is this Kind of Shop Okay?" With the Xbox 360 section getting smaller and smaller at other Japanese game shops, more Xbox 360 owners are having to go online to purchase games. "I wanted a store where you could just walk in, look at a game on the rack while talking with a friend and buy it," said Mirian. "That's why I made this game shop."